The Impact-Proof Phone Case offers enhanced protection and a sleek look! 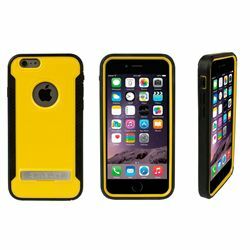 Made of high grade polycarbonate and thermoplastic polyurethane, it provides a shock absorption shield during impact and drops. The built-in, splash resistant screen protector eliminates the need for a separate screen guard. It protects the screen from scratches while maintaining fluid touchscreen sensitivity. TRIPLE LAYERED PROTECTION - A tempered glass screen protector, rubberized phone protector with easy button access and outer shell made of high grade polycarbonate and thermoplastic polyurethane make this case impact-proof and splash-resistant. IMPACT-PROOF - Three layers of protection ensure total shock absorption during impact and drops. DUST-RESISTANT - The built-in screen guard is splash-resistant and dust-resistant, eliminating the need for a separate screen guard. BUILT-IN METAL KICKSTAND - Use hands-free viewing with the rugged metal built-in kickstand. View your phone in landscape orientation with no additional accessories or tools for easy hands-free viewing.